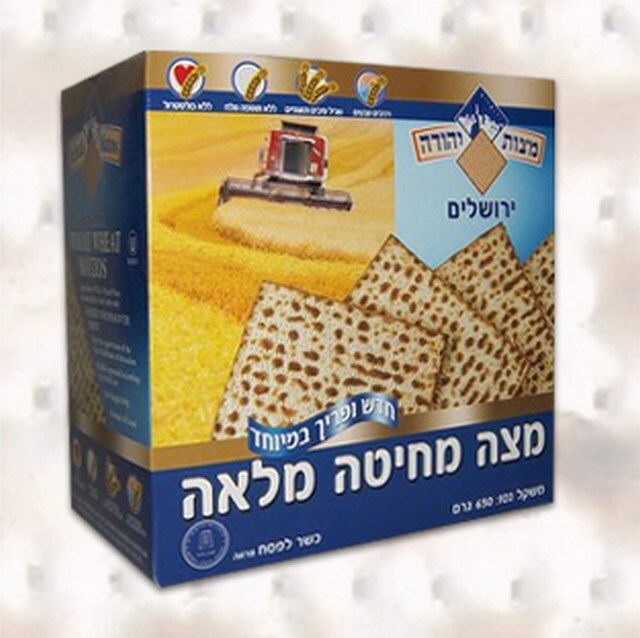 Carton box containing 5 internal packages of 500g (total of 2.5kg) fresh Matzos made of fine wheat flour and water only. The whole package contains 6 units. 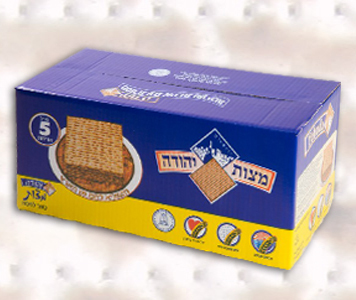 Carton box containing 4 internal packages of 500g (total of 2kg) fresh Matzos made of fine wheat flour and water only. The whole package contains 6 units. 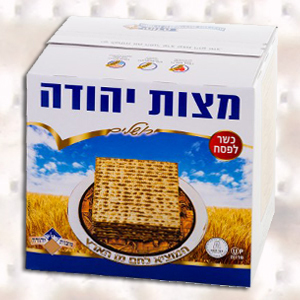 Wrapped box containing 1 internal package of 400g fresh Matzos made of fine wheat flour and water only. The box is packaged in a 30-unit carton. 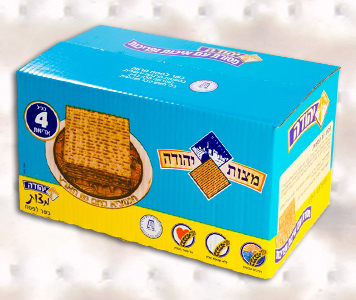 Box containing 2 internal packages of 500g (total of 1kg) fresh Matzos made of fine wheat flour and water only. The whole package contains 12 units. 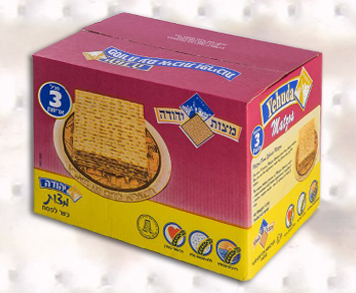 Carton box containing 3 internal packages of 500g (total of 1.5kg) fresh Matzos made of fine wheat flour and water only. The whole package contains 8 units. 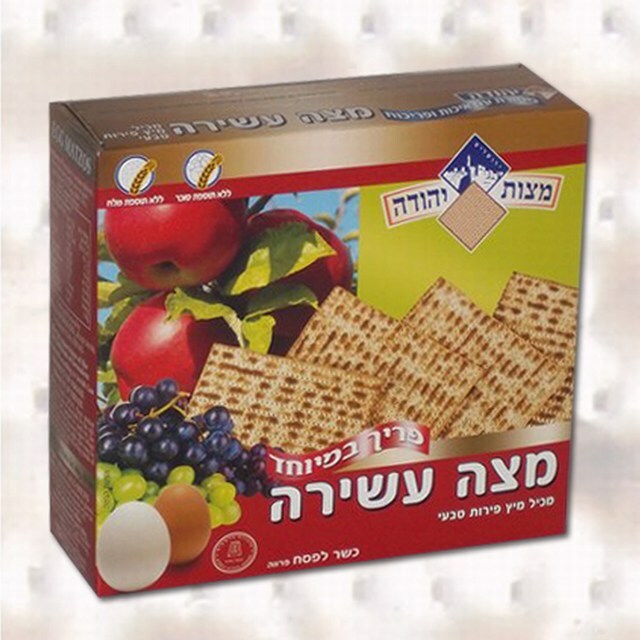 Wrapped box containing 1 internal package of 300g fresh Matzos made of fine wheat flour, natural grape juice and eggs. The box is packaged in a 12-unit carton. Wrapped box containing 2 internal packages of 325g (total of 650gr) fresh Whole Wheat Matzos made of fine whole wheat flour and water only. The whole package contains 12 units. 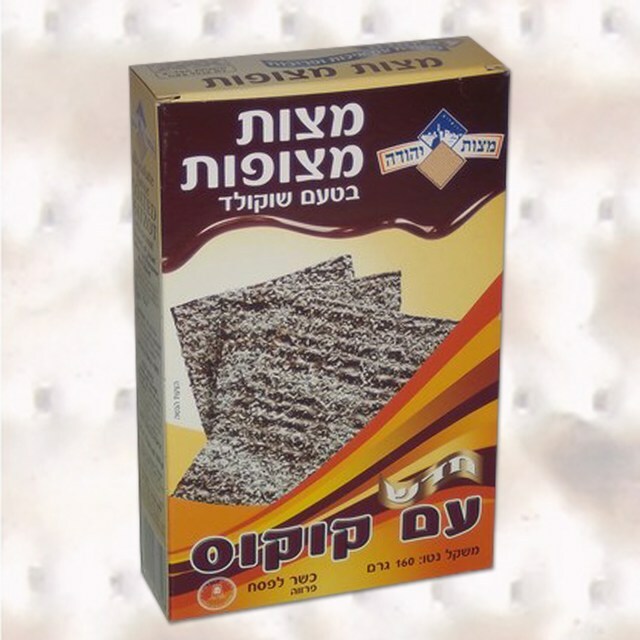 Wrapped box, containing one internal package of 160g fresh matzos (about 3 pieces) made of fine wheat flour and water, chocolate flavor coated and with Coconut. The boxes are packaged in a 12-unit carton or in a 7-unit pack. Wrapped box, containing one internal package of 200g (7 oz.) 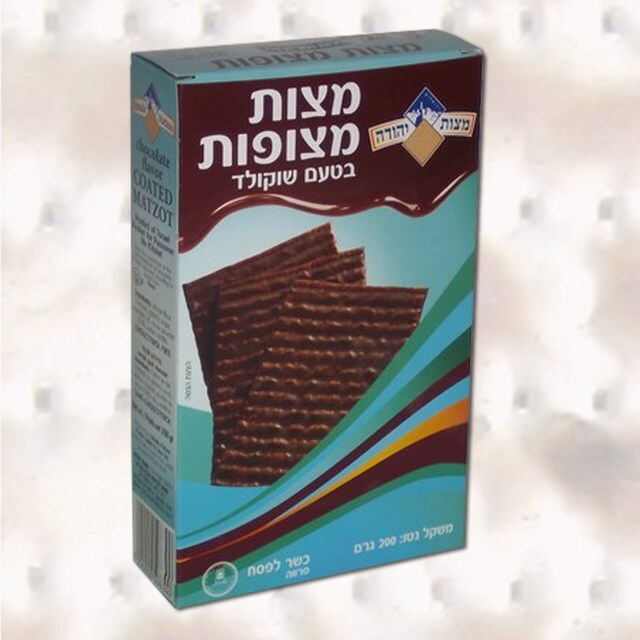 fresh matzos (about 4 pieces) made of fine wheat flour and water, chocolate flavor coated. The boxes are packaged in a 12-unit carton or in a 7-unit pack. 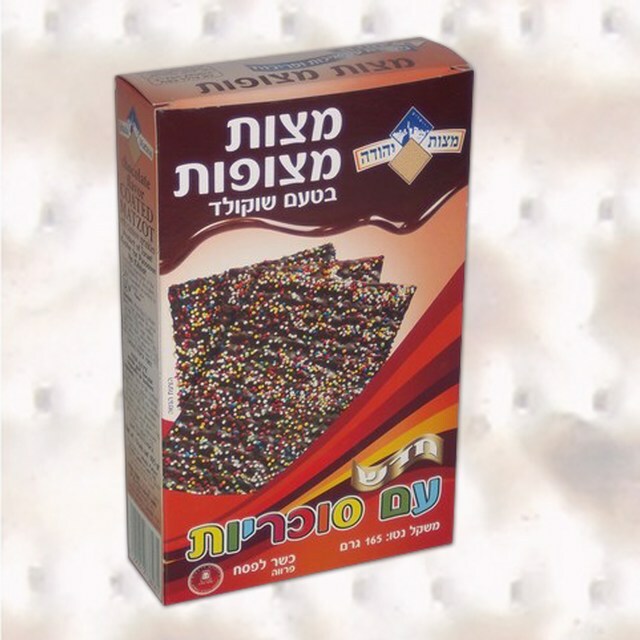 Wrapped box, containing one internal package of 165g fresh matzos (about 3 pieces) made of fine wheat flour and water, chocolate flavor coated and with Rainbow Sprinkles. The boxes are packaged in a 12-unit carton or in a 7-unit pack. 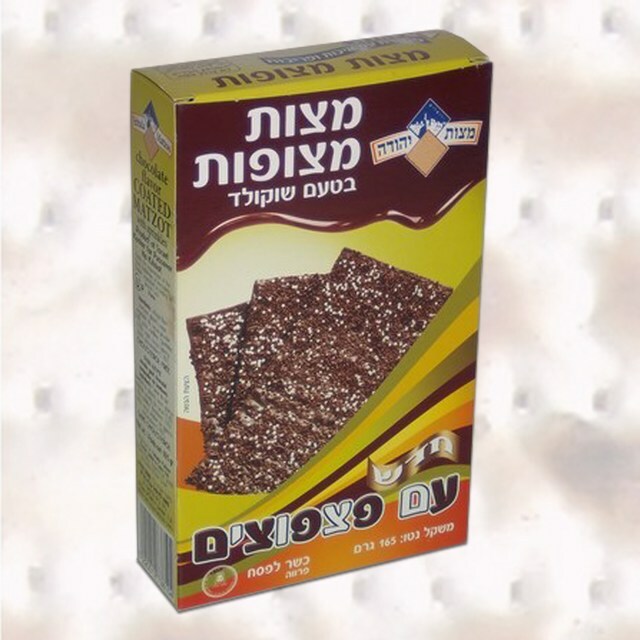 Wrapped box, containing one internal package of 165g fresh matzos (about 3 pieces) made of fine wheat flour and water, chocolate flavor coated and with Sprinkles. The boxes are packaged in a 12-unit carton or in a 7-unit pack. 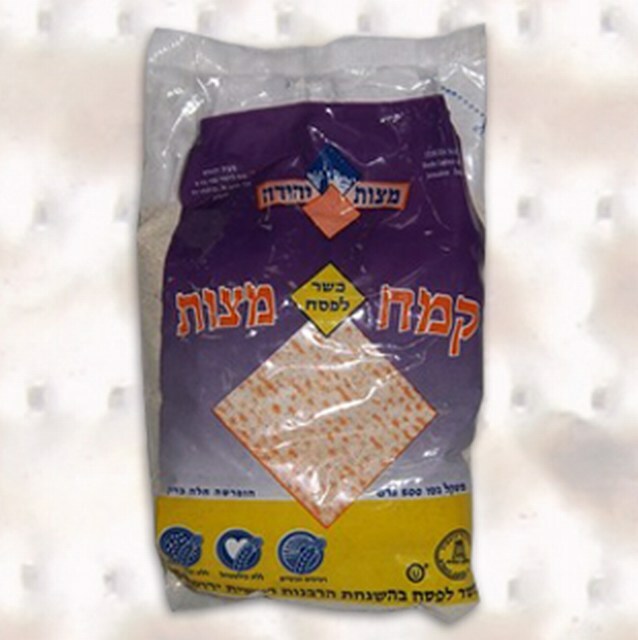 Nylon package containing 500g Matzo Meal (Matzo flour), produced from fresh Matzos milling, made of fine wheat flour and water only. The product is suitable for Kneidallah and Schnitzel crumbs. The whole package contains 30 units. Bags of 20 kg can also be supplied. 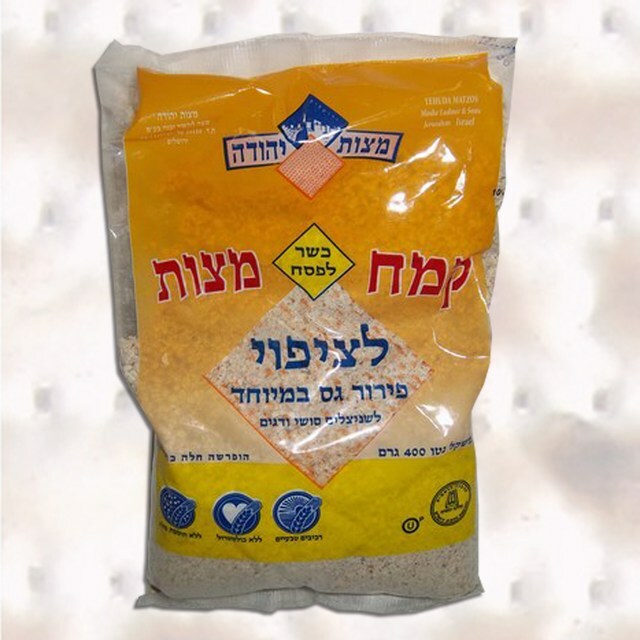 Nylon package containing 400g Coarsed Matzo Meal (Matzo flour), produced from fresh Matzos milling, made of fine wheat flour and water only. The product is suitable for coating Schnitzel, Suchi and Fish The whole package contains 20 units. Bags of 25 kg can also be supplied. 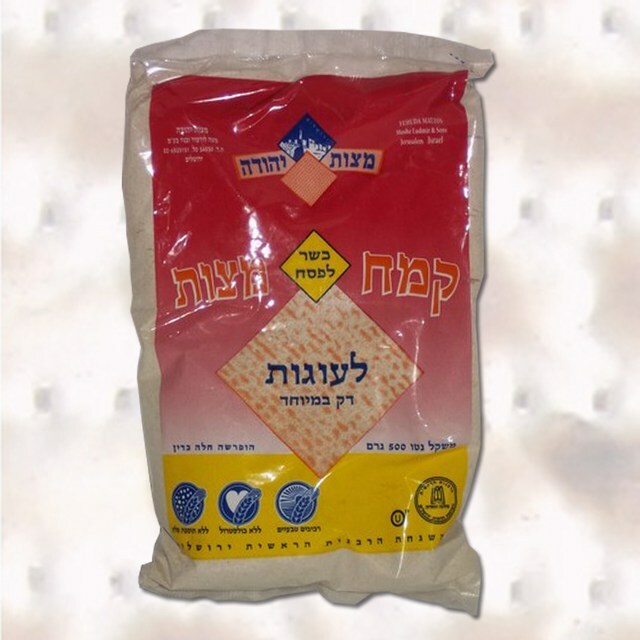 Nylon package containing 500g Matzo Cake Meal (Fine Matzo flour), produced from fresh Matzos milling, made of fine wheat flour and water only. The product is suitable for baking cakes and cookies. The whole package contains 20 units. Bags of 25 kg can also be supplied. 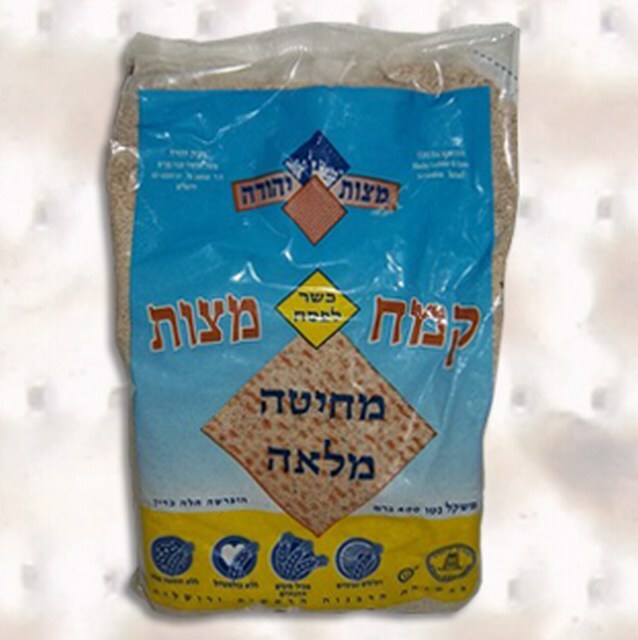 Nylon package containing 400g Whole Wheat Matzo Meal (Matzo flour), produced from fresh Matzos milling, made of fine whole wheat flour and water only. The product is suitable for Kneidallah and Schnitzel crumbs. The whole package contains 20 units. Bags of 20 kg can also be supplied. Box containing 400 gr. 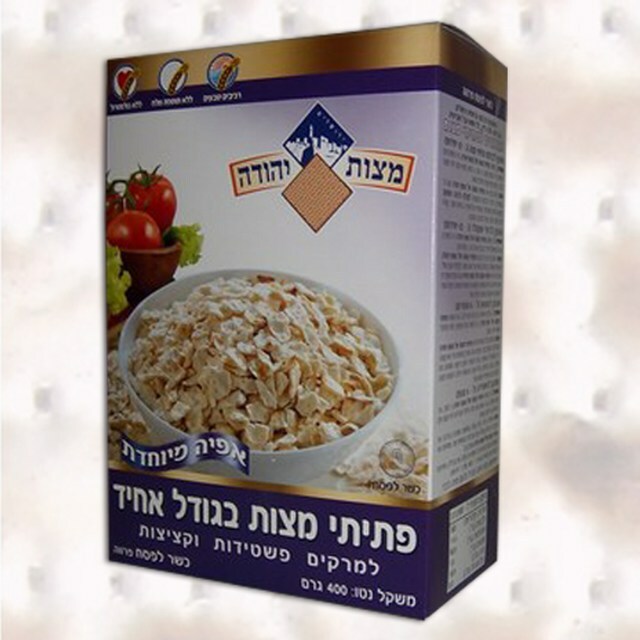 fresh matzo bits made of fine wheat flour and water only, specially baked. The product is great for serving with soups and stuffing but also for trimmings, chocolate balls, doughnuts and other. The boxes are packaged in a 12-unit carton. 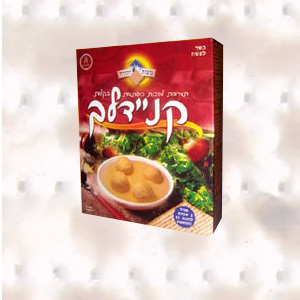 Yehuda Matzos Farfels (special baking) are great for serving with soups and stuffing, but also for trimmings, chocolate balls, doughnuts and others. Ingredients: 2 cups of Yehuda Matzos Farfels, 11/2 cups boiling water, 2-3 tablespoons oil, 1 egg, 3 tablespoons of Yehuda Matzo Meal, 1 teaspoon salt, dash of black pepper. Preparation: Mix all the ingredients, form doughnuts and fry. For sweet doughnuts, instead of the black pepper and the salt, put 2 teaspoons of sugar and a dash of salt. After frying, put some sugar on the ready doughnuts. Ingredients: 11/2 cup of Yehuda Matzos Farfels, 2-3 tablespoons wine, 100 grams chocolate, 50 grams margarine, 2 tablespoons water. Preparation: Mix the Yehuda Matzos Farfels with the wine. Mix and melt the chocolate with water and margarine on low fire until you get a smooth cream. 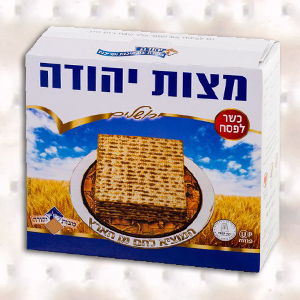 Mix Yehuda Matzos Farfels with the cream and cool. Form small balls and coat them with coconut or walnuts. You can also add to the mixture: almonds, walnuts or raisins. Ingredients: 2 cut onion, 50 grams margarine, 31/2 cups of Yehuda Matzos Farfels, 21/2 cups boiling water, salt, black pepper and spices to taste. Preparation: Fry the onions and mix them with the Yehuda Matzos Farfels, salt, black pepper and spices. Add boiling water and cook on low fire until the farfels absorb the liquid. You can fry and add some other vegetables like green or red pepper, mushrooms, celery etc. Box, containing 2 internal packages of 65g each ( total 4.5 oz.) Matzo Ball Mix for cooking 32 balls. See our "Kneidlah" recipe on the box. The boxes are packaged in a 12-unit carton.